SofType is a software utility which replaces the functionality of a standard keyboard with a full featured on-screen keyboard. SofType can be accessed using a mouse or mouse emulator such as the HeadMouse® Extreme. SofType is compatible with Windows XP, Vista and Windows 7. 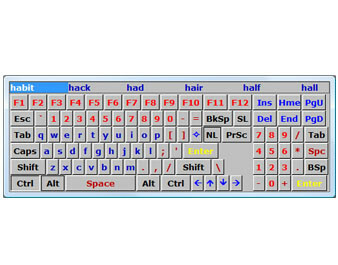 SofType works by generating an image of a keyboard on the computer screen. 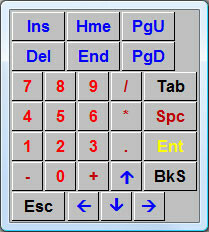 When a key is selected, the character represented by that key is sent to the active Windows application. SofType has a built-in dwell selection feature called AutoClick™. When AutoClick is enabled, clicking functions are performed by holding the pointer motionless (dwell) for a programmable length of time. The Jitter Box feature can be adjusted for a user's capability to control the mouse pointer. Jitter Box is used to enlarge the AutoClick target area and thereby compensate for user instability. Dragger™ is a toolbar integrated into SofType which allows AutoClick and single-switch users to perform all of the common clicking functions of a two-button mouse. Specific buttons on the Dragger toolbar are associated with the common clicking functions -- Double Click, Left Drag, Right Click and Right Drag. Dragger also has an AutoClick Rest (On/Off) button, which enables and disables AutoClick's dwell feature. Floating the Dragger toolbar is a very functional way to use Dragger. This will allow you to position Dragger on a seldom-used area of the screen. 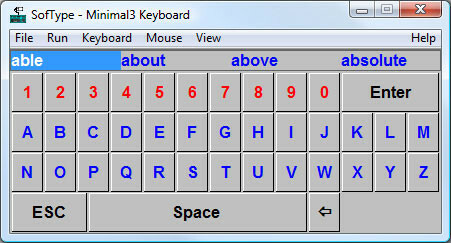 SofType's keyboard can be hidden and still allow the use of Dragger's dwell feature. This is especially useful while using applications which do not require text entry, such as a web browser or card game like Solitaire. Word Prediction eliminates keystrokes when words are selected from the word list. As you begin to type, a list of words is displayed in the Word Bar, which match the spelling of the word you type. When your word appears in the list, simply select that word. This feature will automatically complete the word and add a space at the end. Macro capability and abbreviation expansion make using SofType easier and more enjoyable by eliminating keystrokes when entering frequently used phrases, commands and other text entries. For example, using SofType's macro capability, complete log on sequences to an Internet service provider can be entered with only two clicks. Windows Vista, Windows 7 and Windows 8.